﻿Savings occurs at every level. Utilizing our state-of-the-art mail capture and AP invoice scanning conversion services we can eliminate 100% of the internal labor costs to receive, open, sort, process and route supplier invoices for approval. 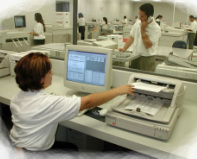 Our state-of-the-art capture and conversion service prevents paper from ever happening in the first place. Capturing paper at the source is key to any successful business process automation strategy. Utilizing our best-in-breed mail conversion and scanning services, we will process all inbound supplier invoices and apply your unique business rules to ensure the mail is processed right the first time. No more delays or bottlenecks in your accounts payable processing. Invoices are mailed to a secure PO Box where only authorized staff have access. Each day we retrieve your mail for processing. We open, sort, scan and capture all relevant details from each and every invoice for processing. "Since utilizing the mail processing services offered by BlueCreek and Vision360, we've cut our processing time in half!" Our document capture and mail conversion services will manager the life cycle of your invoices from secure PO Box receipt through the validation process to long-term archiving, so you don't have to worry about a thing.